Directed by: Jermaine Clement and Taika Waititi. Written by: Jermaine Clement, Taika Waititi. Starring: Jermaine Clement, Taika Waititi, Rhys Darby, Jonathan Brugh, Cori Gonzalez-Macuer, Stu Rutherford, Ben Fransham and Jackie Van Beek. Synopsis: A documentary crew follows around a quartet of vampires and hilarity ensues. Originally appeared in Central Track here. Whenever a genre spoofs gets released, it's usually pretty easy to spot just how well-versed the filmmakers are in the tropes of that realm. In turn, the best spoofs come of less like send-ups and more like humorous homages. In other words they fit within the same genre boundaries as the films they're mocking. Take Airplane!, for instance. It's one of the best disaster movies and comedies produced. Then, on the other end of the spectrum, you'vie got entries like Epic Movie. Films like that one miss the mark, casting D-list actors into roles where they do little more than just re-create scenes from 300. Here's the good news: What We Do In The Shadows, the vampire send-up from Flight of the Conchords' Jemain Clement and his sometime collaborator Taika Waititi, falls in with theAirplane! category. Beyond simply existing as one of the best-written comedies released in recent history, it also mixes in a fine understanding of vampire lore. The premise here is documentary-style effort in which a camera crew follows a cadre of of vampires -- Viago (Waititi), Deacon (Brugh), Valdislav (Clement) and Petyr (Fransham) -- who are all living together in Wellington, New Zealand, with the youngest of them being 187 years old. And it's all kinds of fun, too: We get to see these blood-suckers trying to live modern lives and facing all of the various and hilarious difficulties this entails. For instance? One of these vampires' daily rituals is to go out and hunt for fresh blood at nightclubs. But there are some problems: These guys have have to dress up to fit in at these venue; but they can't see their reflections in the mirror, and, more hilariously, vampire rules dictate that they can't enter the club without an invitation. The humor's in the tedium of it all -- and not in dumb ways, either. Part of the genius to this film is the way in which it references vampire history. Petyr, an 8,000-year-old vampire, is basically Nosferatu, His pal Vladislav (nicknamed "The Poker"), meanwhile, is an obvious parody of Vladmir The Impaler, the supposed inspiration for Bram Stoker's book. Viago, on the other hand, fits in with the Anne Rice-penned, romantic ideal. And the references don't stop there: Everything from The Lost Boys to Twilight. gets bitten throughout the course of this film's run. That said, a majority of the hilarity here comes from the fact that these vampires have to deal with very human annoyances, too. Assigning chores, dealing with jealousy and fending off ex-girlfriends are very real problems for our subjects. And, ultimately, what makes all of this work is the chemistry that the three main vampires have with each other. Viago is the neat one that tries to make everyone fall in line, Deacon is the hot-headed young one and the hyper-sexual Vladislav is delightfully eccentric. The way they fight and bicker with one another will remind anyone who's ever lived with a roommates about the struggles of those day-to-day experiences and the camaraderie that comes into play when these companions leave the house and team up for their hunting excursions. Aside from these antics, the plot here kicks up whenever Nick, a human that Petyr turns during a botched feeding, makes himself a part of the group along with his human friend Stu, whose bookish presence and quiet demeanor steal the movie. Nick's addition into the group means that he replaces Deacon as its youngest member, and his youth comes into play nicely as he helps the other vampires slowly but surely learn how to incorporate technology into their methods, thus helping them better integrate into society -- and, sure, nightclubs, too. If there's a complaint to be had here, it's just that the documentary format feels a little restrictive. As with most of the "found footage" movies, the camera man keeps on shooting and going after his shot, even in situations where a sane person would likely turn and run for his life. In addition, there's only a single female character of note, and, after she's introduced as Deacon's victim-baiting servant, the story largely leaves her behind. 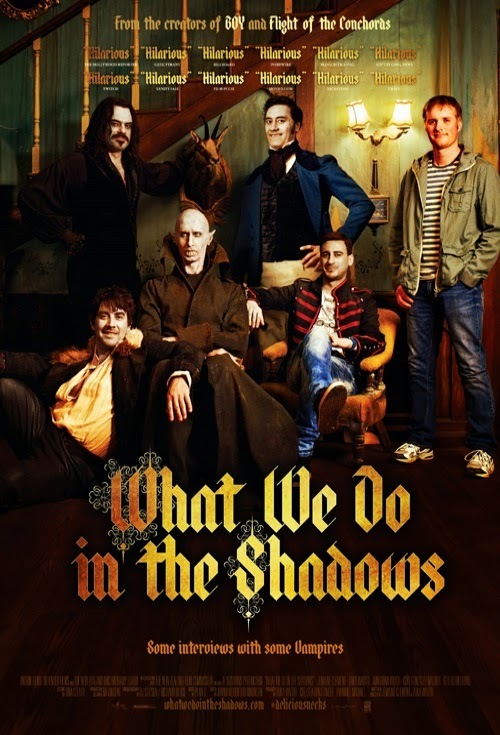 That said, What We Do In The Shadows is a must-see movie for any horror fan out there. For this set, thanks to the films many vampire deep cuts that are peppered throughout, repeated viewings seem inevitable. But even the more casual vampire and comedy fans among us will still finds this effort charming. As well they should: This film's got some real bite to it.